Emergency lighting systems protect life and avoid accidents. They illuminate essential work areas and escape routes when normal lighting systems fail from causes such as fire, power cut or other emergency. 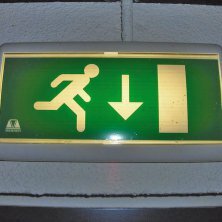 We can help you to meet your responsibilities to your employees, visitors and customers by designing, supplying and installing the most efficient and cost effective emergency lighting system for your premises. All our fire alarm and emergency lighting systems are available with full certification and maintenance packages to enable you to meet your legal requirements on a continuing basis. For further details regarding the any of the services we offer or to discuss your individual requirements, please do not hesitate to contact us.